Before You Go: Rogue River Rafting OARS. The Rogue River might just be the perfect rafting trip. The generally moderate whitewater is ideal for all levels of experience from beginner to intermediate. Rapids such as Blossom Bar and Rainie Falls are sure to inspire a generous dose of adrenaline. For the more adventurous, our inflatable kayaks provide an up-close and personal encounter with the rapids of the Rogue. Your trip will surely be witnessed, whether you know it or not, by the abundant wildlife living onshore. The most common sightings include deer with an occasional black bear or river otter, and the many bird species seen along the way including great blue heron, bald eagle and osprey. Indeed, this river canyon is the birdwatcher’s as well as fisherman’s delight. As for the accommodations, we will make camp at the river’s edge with the dense forest creating a beautiful backdrop. Inside a tent or under the starry night sky, you’ll sleep soundly, serenaded by boisterous crickets and the rush of the passing river. We’ll meet at 6:00pm for a pre-trip meeting at the Galice Resort in Merlin, OR. The “resort” is an all in one gas station, small store, restaurant and rustic lodge. An OARS guide will greet you on the front porch of the store/restaurant and direct you up the hill to the meeting location. If you somehow miss the OARS staff person, you can ask at the counter instide the store/restaurant to be pointed in the right direction to the meeting. The pre-trip meeting is an opportunity to meet your fellow travelers and trip leader and ask any last-minute questions. Your trip leader will give you a thorough trip orientation and pass out waterproof river bags so that you can pack your belongings that evening. Your trip leader will also discuss the time to meet at Galice Resort the following morning to be transfered to the launch point. You will be transferred from Galice Resort to the put-in, which is just a short drive down the road. Here, you’ll meet the rest of your guides at the boat ramp and listen to a thorough safety talk on trip procedures. The anticipation will build as you board the rafts and push off from the shore to head downstream. The lush forests rise up around you, heightening the sense of isolation from the outside world. After a few small rapids, you’ll probably notice that appetites on river trips are larger than those at home; lunch comes just in time. The afternoon brings us to exciting Rainie Falls—the first real test of our whitewater skills. Below Rainie, you may hike to a historic cabin, try swimming a rapid, or just enjoy some relaxing slow water. Your first night at camp, the guides will demonstrate how you will set up your tent and explain the ins and outs of comfort at camp. While the guides prepare dinner, you’ll have time to have a short hike, explore the wooded terrain, read a good book, or just relax with a beverage of your choice. Each morning, the early risers will be greeted around 7:00 AM with hot coffee, tea and cocoa; the group wake-up call comes about 7:30 AM, and breakfast is served around 8:00 AM. After you pack your belongings, you’ll have some time to relax while camp is broken down and the boats are loaded. The inflatable kayaks are put to use as the most adventurous take control of their own crafts. These boats are a kick, even in the smallest rapids. Your guides will give you pointers on navigation and soon river lingo like “eddy,” “ferry angle” and “river right” will be part of your vocabulary. Some days include lots of action through many Class II and III rapids and others are more mellow. Each day we might try for a short hike up a lush side canyon or to a historic site. Most days we’ll get to camp sometime around 4:00 PM. As we continue down the canyon, we will take time to enjoy the beauty and history the Rogue has to offer. Perhaps we will stop at one of the several historic home sites, most of which are maintained as museums of human history offering insights into the canyon’s past. These sites are just a few minutes’ walk from the river. The Rogue also features highlights such as the sheer rock walls and deep, rolling currents of Mule Creek Canyon, and the exceptionally challenging rapid called Blossom Bar, which is followed by tranquil Huggin’s Canyon. Our 5-day trips allow for more time to explore the Rogue River Canyon with all of it’s hidden gems and may even include a layover day. Your guides might let you sleep in, but everybody knows the dawning hours are the best in which to catch a fish, take a brisk hike or paint the sunrise. Your guides will offer activities for the day, which may include voluntary swimming, hiking up a side creek, experiencing the natural water slide at Tate Creek, or visiting the enchanted Brushy Bar Forest. Those who choose to stay at camp may like to take out books, diaries or sketchbooks and enjoy some peaceful “alone-time.” Others may try their luck with their fly rod. Breakfast is just as hearty on the last day as it was on the first morning. Leaving camp is bittersweet—you might not be quite ready for civilization again, but a hot shower will sound pretty good! A few guests may practice their newfound rowing skills on the last day, while the guides keep their eyes peeled for the bald eagles that inhabit the final section of the river canyon. After lunch, we have a short float to our take-out point at Foster Bar, where we’ll arrive around 2:00 PM. We’ll pack up the vans and then relax for the scenic, 2-3 hour mountain drive back to Galice Resort. (Note: Occasionally, road closures may necessitate a longer return shuttle route of 5 hours.) Regardless of route, you should arrive back to Galice before 6:00 PM. Sleep Kit: Can be rented for $40 per person. Sleep kits consist of a sleeping bag with zipped in sheet liner, a deluxe 3-inch thick foam and air-filled sleeping pad, ground tarp, pillow and pillowcase. The day before your trip, we will meet at 6:00 PM at Galice Resort in Merlin, OR. The “resort” is an all in one gas station, small store, restaurant and rustic lodge. An OARS guide will greet you on the front porch of the store/restaurant and direct you up the hill to the meeting location. If you somehow miss the OARS staff person, you can ask at the counter inside the store/restaurant to be pointed in the right direction to the meeting. Your trip leader will provide a thorough trip orientation and pass out your waterproof bags so that you can pack your belongings that evening. The trip leader will also reconfirm the time for meeting at Galice Resort the following morning and give you an opportunity to ask any last-minute questions. Merlin is just northwest of Medford and Grants Pass. Take the Merlin exit (#61) just 3 miles north of the northern most Grants Pass exit (#58). Go west on Merlin-Galice Road for 15 ½ miles. 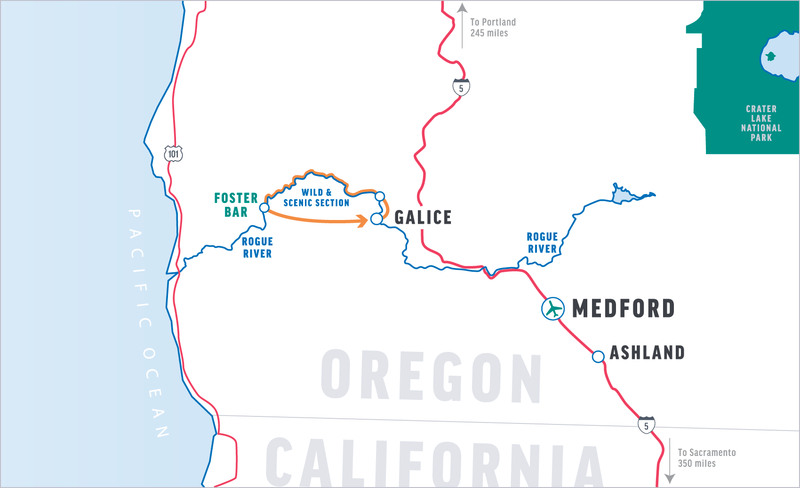 You will cross a large, yellow bridge over the Rogue River about five miles before you reach Galice Resort. The store/restaurant/front porch is on your right with a sign that says, “This is Galice.” The address is 11744 Galice Rd, Merlin, OR 97532. You may park your car at Galice Resort during your trip. Please note: If you are planning to visit the Oregon Coast following your trip, we recommend you have your car shuttled to the take-out location at Foster Bar, so it is waiting for you when you get off the river. This will save you five or more hours of driving time and backtracking. For this option, you will need to arrange for your car to be transferred from Galice Resort to the take-out at Foster Bar so that you can continue heading west, to the coast, from there. You will arrive at Foster Bar between 2 and 3 PM. Galice Shuttle Service can arrange this car shuttle service for you. Please contact Galice directly with your questions. It is possible to set up this option once you arrive in person. Please contact us before your trip to alert us that you plan to make arrangements to have your car shuttled to Foster Bar. Come prepared with a duplicate set of car keys. Wilderness Gourmet: For those with a palate for great food, exquisite wine and adventure, the OARS Wilderness Gourmet Series brings a traditional culinary classroom setting to the river. OARS’ guest chefs have years of experience preparing delectable cuisine both on and off the river and invite you to share the adventure while learning a thing or two from the experts. Wine on the River: Our wine trips offer an elegant alternative to our regular departures, and combine mouth-watering menus and award-winning wines with the appeal of the wilds. After each day of river rafting, enjoy gourmet meals and premium wines introduced by regional experts. The wines are carefully chosen to complement the bill of fare each night, and each winery brings its own personality to the river, where tastings can turn into blending seminars or informative discussions of Old World versus New World wine making. Rest assured that these trips inevitably result in an outrageously good time. Craft Beer Tasting on the River: Our Craft Beer Tasting trips combine mouthwatering menus prepared by an executive chef with beer (and wine) carefully chosen to complement each night’s menu. Maybe it’s just because beer is mostly water and paddling through exhilarating rapids can leave you parched, but we think you’ll agree that enjoying hand-selected micros-brews on the banks of a river is about as good as it gets. Women Only: Like our adult-only trips, our women’s trips are kid-free vacations that offer a fun way for female guests to meet other like-minded travelers who share an enthusiasm for adventure travel and the outdoors. Bring a friend, your mom, your partner, your sister, or go solo. These trips also feature a talented cast of exclusively female guides to help even the most novice campers feel comfortable in the wild. After each active day on the river, we pull ashore to camp for the night. Upon arrival, our first task is to unload the boats using a fire-line of crew and passengers to expedite the process. Individuals then collect their waterproof bags and locate an area on shore to camp for the night. On the first night in camp, a crew member will give a demonstration on setting up a tent, which you’ll see is quick and easy to do. The guides will set up the kitchen and central dining/seating area with camp chairs. They will also locate a secluded area away from camp to set up the portable toilet. As dinner is prepared by the guides, you might enjoy some hors d’oeuvres while you have an opportunity to relax, enjoy a drink if you wish, and reflect on the day with your fellow traveling companions. In the morning, the first wake-up call will let you know that coffee, hot water for tea or cocoa, juice, fresh fruit and cold cereal are ready on the hors d’oeuvres table. You can fill your mug and grab a bite, then begin to pack up your personal belongings and sleep gear as the guides prepare a hearty breakfast. After breakfast is served, the entire camp will be broken down and packing will be completed. The gear will then be loaded onto the boats and we’ll head downstream to see what new adventures await us. We provide plenty of water and juice throughout the trip. While on the river, we provide one soda per person per day along with a limited supply of beer and wine. You are welcome to bring your own favorite beverages, alcoholic or non-alcoholic, in non-glass containers. If you choose to bring additional beverages, please let us know in advance. For your safety and the safety of others, alcoholic beverages are limited to camp. We also carry a small container called the “day tripper,” which can be easily accessed during the day should the need arise. It is a personal, disposable toilet, which includes an odor-proof transport bag, chemical solidifier and odor eliminator, toilet paper and an oversized hand wipe. Bathing is allowed in the Rogue River, but not in any of the side streams that feed into the river. We recommend using the smallest amount possible of soap. (Biodegradable options such as Campsuds or Dr. Bronner’s, which can be purchased in most stores that have a camping section, are eco-friendly options.) Disposable anti-bacterial towelettes (Coleman Swash Cloths, baby wipes, etc.) are good alternatives to submersion in the river, and they are especially convenient for spring and fall trips. At the pre-trip meeting each person will be given two large waterproof bags (approximate sealed size: 13” diameter x 25” tall; 3318 cu in; 54.4 L). One bag will be for your clothing and personal items. The second bag will be for your sleeping gear (sleeping bag, sleeping pad, ground tarp, sheet and pillow). These two bags will essentially be your “checked luggage” and will only be accessible in camp. Tents are stowed separately. Please note: if you rent our sleep kit, it will come already packed in one of the two waterproof bags issued to each passenger. We also provide a small waterproof bag per person for day use, where you can keep items such as raingear, camera, sunscreen, lip balm, etc. (approximate sealed size: 17” tall x 9” diameter; 1081 cu in; 17.7 L). The bags are cylindrical and pack from the top. Please pack light; river attire is very casual―comfort, convenience and boat space takes precedence over style. At the end of the trip you will return to Galice Resort with your packed waterproof bags where you will be able to unpack your gear for your return trip home. If you have extra luggage, it should be locked in your car or stored at your hotel. It is an option to leave extra luggage at the Galice Resort. We recommend you leave your valuables at home. For personal items like wallets, purses and cell phones, we recommend leaving them in the locked luggage room at the Galice Resort. If you enjoyed your trip, consider donating to The Pam & George Wendt Foundation . This organization is a not-for-profit 501 (c) 3 organization with the express goal of providing opportunities for young people to experience the magic of the outdoors. Visit https://www.oars.com/oars-foundation/ to learn more about how a tax-deductible donation can change young lives for the better. Everyone is required to sign a standard liability release/acknowledgement of risk form before the trip, acknowledging awareness that there are inherent risks associated with the trip. Due to the nature of the activities, a condition of your participation is that you will sign this form and return it to our office before the trip begins. Anyone who refuses to sign the form will not be allowed to participate, and consistent with OARS cancellation policy, there will be no refund of the trip fees at that time. O.A.R.S. West, Inc. and cooperating agencies act only in the capacity of agent for the participants in all matters relating to transportation and/or all other related travel services, and assume no responsibility however caused for injury, loss or damage to person or property in connection with any service, including but not limited to that resulting directly or indirectly from acts of God, detention, annoyance, delays and expenses arising from quarantine, strikes, theft, pilferage, force majeure, failure of any means of conveyance to arrive or depart as scheduled, civil disturbances, government restrictions or regulations, and discrepancies or change in transit over which it has no control. Reasonable changes in itinerary may be made where deemed advisable for the comfort and wellbeing of the participants, including cancellation due to water fluctuation, insufficient bookings (this trip requires a minimum of 4 guests – 6 for gourmet, craft beer and wine trips), and other factors. There is risk in whitewater rafting, particularly during high-water conditions. Rafts, dories and kayaks do capsize. You could be swept overboard. Your guide will make every attempt to assist, but you must be strong and agile enough to “self-help” and “float-it-out” without further endangering yourself or others. We reserve the right not to accept passengers weighing more than 260 pounds or with a waist/chest size exceeding 56 inches. We may decide, at any time, to exclude any person or group for any reason we feel is related to the safety of our trips. We are experienced at accommodating people with various disabilities. Please give us an opportunity to make you feel welcome. We need to discuss any special requirements ahead of time. On advancement of deposit the depositor agrees to be bound by the above recited terms and conditions. Prices subject to change without notice.